Designed for installation directly in front of the loading dock. The electric hydraulic system lifts the hook bar to capture the ICC bar on the back of semi-trailers. To ensure maximum safety the unit comes standard with an accumulator that allows the lock to follow the trailer up and down as it is loaded/unloaded. A beeper and flashing light warns the operator if the lock does not engage the trailer properly. A visual indication of the restraints status is shown at all times by the traffic light outside and the control panel inside. Comes standard with light package, control panel and three large visual signs. Emergency Hook Release Pin - Allows trailers to be released in the event of power outage or malfunction. 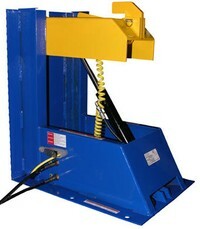 "Floats" with Trailers - Once the hook is raised into position the motor shuts off. 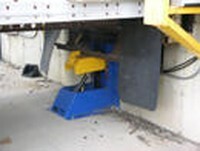 The hook will follow the various trailer heights, up or down, during Loading/Unloading. This accomplished through an in-line accumulator. Operator Warned If Hook Misses Or If Hook Is Restricted - If the hook is interfered with or misses the ICC bar, it will automatically retract and the control panel will alert the attendant. The attendant must then chock the wheels and change the lights manually on the control panel. 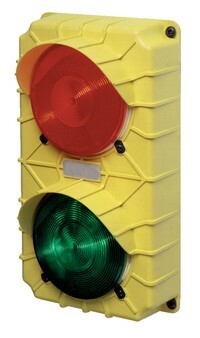 Comes standard with our Dock Traffic Control System - Model V-DTS-5 (Pic. 3- Poly) or V-DTS-10 (Pic. 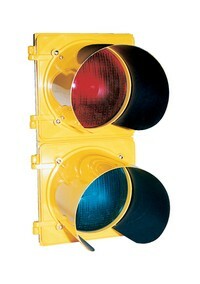 4 - Aluminum) - includes light fixture and control panel and four procedure signs (Pic. 5).